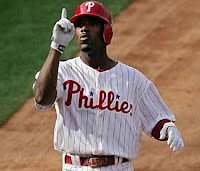 PBR - Jimmy Rollins homered and drove in three runs to lead the Phillies past the Miami Marlins on Tuesday night at Citizens Bank Park, 9-7. The victory pushed the Phillies to the .500 mark for the first time since June 4. The win also brought the Phillies to within 4.5 games of the St. Louis Cardinals for the final NL Wildcard spot. Roy Halladay surrendered five runs on seven hits over 6 1/3 innings but was able to secure the win, his fourth in his last five starts. Jonathan Papelbon worked a perfect final frame to record his 33rd save of the season. Juan Pierre and Chase Utley each chipped in with three hits a piece in the victory. Nathan Eovaldi hurled four innings for the Marlins, surrendering five runs on eight hits in the loss. Trailing 8-3 heading into the seventh, the Marlins chased Halladay and scored four runs to trim the deficit but the Phillies answered with a run in the bottom of the frame to push the contest out of reach. The two teams conclude their series Wednesday afternoon with Cliff Lee scheduled to oppose Josh Johnson.